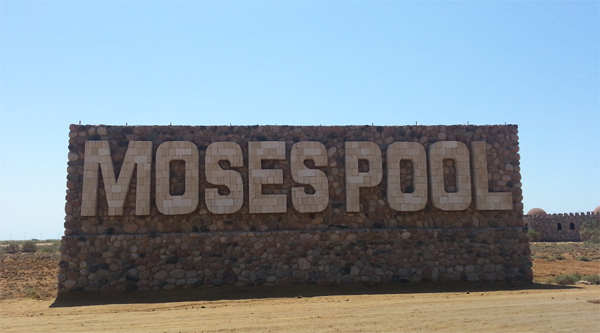 Moses Pool near Sharm el Sheikh. At Moses bath, el Tor city. According to scientific research, clay found in some springs has therapeutic properties that can cure numerous bone, skin, kidney and gastrointestinal diseases and respiratory problems. The Red Sea water with its chemical composition and abundance of coral reefs help cure from psoriasis. After entering Sinai and turning south along the coastal highway one soon comes to Ayun Moussa - one of the most important religious pilgrimage sites in Sinai. 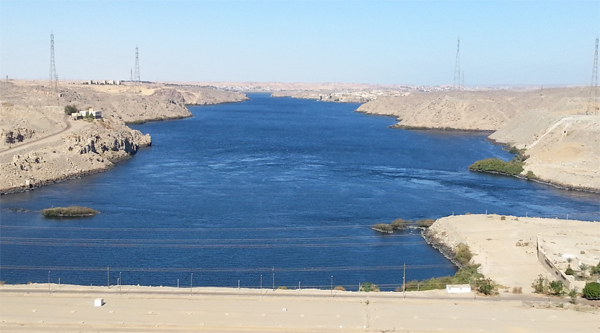 There are 12 springs in the Ayun Moussa Oasis, which lies 35 kilometres south of Suez, 60km from the Ahmed Hamdi Tunnel that links Suez and Sinai, and 165km from Cairo. Ayun Moussa is believed to contain the spring where Moses, after leading the Israelites across the Red Sea, turned a bitter water source into sweet drinking water by throwing a tree branch into it, as instructed by God. Beside each spring is a label with the name of the spring and its depth. The average depth is about 14 metres. Today there is only one spring, called al-Sheikh, that provides sweet drinking water. Ayun Moussa also comprises a number of archaeological sites dating back to the Greek, Roman and Byzantine eras. The most prominent area, called al-Ummal (the Labourers), includes a number of kilns used for firing pottery, one of the major industries in ancient Egypt. The search for old wells. A number of sensors were used to search for dry wells, with the aim of tracing the old water sources in the region which was a starting point of pilgrimage for both Muslims who went to Mecca and Christians who went to Jerusalem. More springs that have been filled in by wind-blown sand are under exploration.. The Egyptian excavation team has found several of the pottery kilns, a large number of pottery pieces, labourers’ houses and 9 of the original 12 water wells. Modern studies have proved that the region from Suez to Ayun Moussa was dry and very arid, just as described by pilgrims who visited the region in the 18th and 19th centuries. The water streaming through the oasis, however, nurtured abundant date palms and grasses. Roman engineers fortified the wells with brick walls to preserve them from being filled by sand. During the Islamic era, Ayun Moussa was a major station for Red Sea traffic. Offshore in 1538, Venetian ships massed with ships of the fleet of Ottoman Sultan Suliman II against Portuguese warships, and the Venetians constructed a canal extending from the springs to the Red Sea coast to supply their crews with sweet water. Remains of this canal still exist today. Despite its reek of rotten eggs, sulphuric water is believed to be effective in the treatment of bone, skin, liver and kidney diseases. Other springs in the south of the oasis include Ayn Abu Morir on the eastern side of the road to al-Tor, which is a fresh water well surrounded by clusters of rare palmsand reeds, and Ayn Taraqi, another sulphuric spring with temperatures ranging between 20C and 30C. Here are some other therapeutic sites in Sinai, where you can go for a day or so. Approx. 45 km south of Ras Sedr, there is the Pharaoh's Bath called Hammam Pharaon. Together with Oyoun Mossa (Moses springs) it is some of the most important sites for therapeutic tourism in South Sinai as it has the highest rate of sulfuric water known to the world. 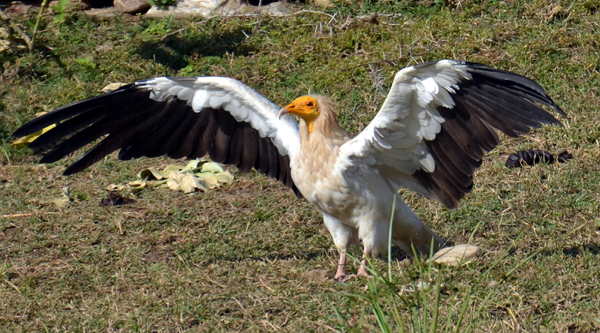 In addition, it enjoys dry weather and warm sands. Few people today realize the significance of Egypt's therapeutic past. During the 19th and 20th centuries, Egypt was almost as important to European travelers as a health destination as it was for classical antiquity tours. 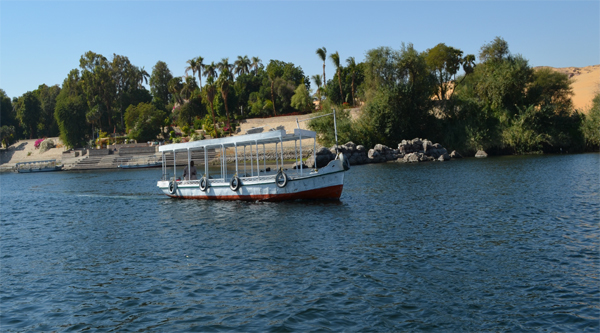 Egypt's hot, dry climate and numerous natural hot springs are waiting to be re-discovered. Hammam Pharaon (Pharaoh's Bath ) is one of the most famous springs lies on the southern part of the Ayun Moussa Oasis about 45km from Suez and 125km from Cairo. It consists of two parts: the Kahf Pharaoun, or Pharaoh’s Cave, and the springs themselves. The cave extends about 25 metres into the mountain, while the sulphuric water springs which line the seashore produce significant quantities of water with temperatures as high as 92C. It consists of a group of natural hot sulfuric springs whose temperature is average 27 degrees. The water flows directly from the mountain into a 100- meter-long natural lake right beside the sea shore. A small cave has been carved out of the mountainside above for use as a natural sauna. It has been scientifically proven that the water from this spring can help alleviate a number of diseases, including rheumatism, rheumatoid pains, kidney diseases, lung inflammation and several skin diseases. For centuries locals and travelers have been enjoying the spa waters of the natural hot springs. The water, smelling slightly unpleasantly of sulphur, bubbles from the rock inside a cave and flows down into the sea. In the cave, where the darkness is heavy with steam, guests can enjoy a soak in the rock bath, or else wait for their turn for a therapeutic treatment for rheumatism, skin diseases or other ailments. An Egyptian archaeological mission while carrying out a routine cleaning operation in the area near the spring stumbled upon what is believed to be a fourth-century rock-hewn grotto decorated with Christian murals. It appears to be the second cave of its type to be discovered in Hammamat Pharaon and was only 25 meters away from the first one, which was used one to two hundred years later. The entrance to the new cave was blocked by a large amount of sand, stones and rubble. When all the dust and debris were removed a one meter high vaulted entrance was unearthed. The cave excavated consisted of a large hall on two levels, the first level bearing some clay fragments and traces of a fireplace that burnt wood, and the second traces of ashes. On cleaning the fireplace the archaeologists uncovered a limestone floor and the remains of a large clay vessel. The internal walls of the cave are covered with a layer of plaster decorated with red-painted Greek characters similar to those found in the first cave. A number of Byzantine-shaped crosses were also painted on the walls. The cave found earlier had three adjoining vaulted halls; the first and third halls were plain and empty, but in the central one was a scene depicted in red paint of three notable Christian figures praying; from right to left these were St Mina, the Roman soldier who sacrificed his life to spread Christianity all over the globe, Iowans, the Alexandrian patriarch of the sixth century, and Asnasious, patriarch of the Constantine Church. These portraits were enclosed within Greek prayer texts along with crosses painted in the style of the sixth and seventh centuries, and were similar to those found on the walls of St Catherine's Monastery in Sinai. A three-legged chandelier was painted in black, along with remains of other drawings painted in yellow and red. On the left side of the scene were three niches decorated with old Creek texts painted in brown and black. Moses Pool or rather Hammam Moussa as it is better known in Arabic, is located in South Sinai's official capital, Al-Tor. It is a wonderful oasis covered in palm trees around a natural hot spring, the water of which is capable of healing wounds especially of diabetic patients, treats the body weakness and regulates the high blood pressure. Moses Bath is 100 kilometers away from Sharm EI Sheikh. Legend says that Moses passed here one day. Wanting to quench his thirst he asked the old lady by the spring if he can have some water to drink; surprisingly she refused. Moses prayed to God to bless the water with therapeutic properties, but never to be potable. Whether the legend is true or a mythical fabric of someone's imagination, the spring's water is indeed saline and enjoys a good deal of mineral concentration. Sours "Al-Ahram"